With this Japan vacation, discover the verdant landscapes and historic landmarks of Kyushu, the westernmost island in the country. Travel between eclectic trading towns and vibrant centers of unique art and culture, hike past active volcanoes, lounge in tropical island paradises, and explore ancient ruins and legends at your own pace, on your customized Kyushu tour. 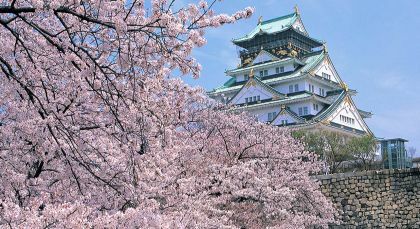 Fukuoka is a strategic harbor city anchored on Kyushu island in southern Japan. Historically, part of marine trade routes since the 13th century, discover a wealthy, cosmopolitan metropolis. Discover the largest city of the Kyūshū archipelago! 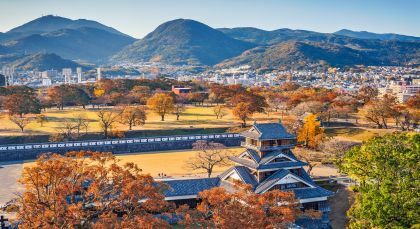 With a trading history that goes back centuries, the modern city of Fukuoka straddles the old castle town on the west and the Hakata ward on the east of the Naka-gawa. Stroll along the seaside and visit Fukuoka Tower – the city’s tallest building, it offers panoramic views of beautiful Fukuoka and Hakata Bay from the observation deck. Hop over to the city center and visit Ohori Park, part of which once served as a moat for the old Fukuoka Castle. Afterwards, drop by the open-air museum of Hakata Machiya Furusato Kan to learn where you will learn about the history of this charming city. 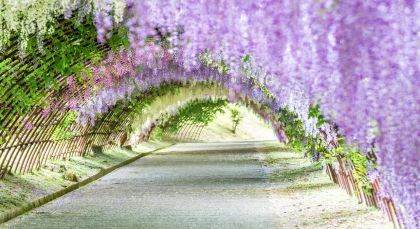 Pay a visit to the ancient Kushida Shrine with its striking Natural National Treasures: an enormous torii gate and ginkgo tree. Let your hair down at Tenjin, the city’s exciting nightlife destination, before calling it a day. (Full Day; Fitness Level: Moderate; Please bring comfortable walking shoes). Try out the simple yet hearty culinary delights that Fukuoka is famous for! Accompanied by your expert guide, go hunting for Fukuoka’s iconic Yatai or open-air food stands that typically accommodate a handful of hungry patrons in a congenial outdoor setting. Although the city boasts more than a hundred such Yatai that serve a range of delicious ramen or noodle bowls, the best are to be found on Nakasu Island, right in the heart of the city. Stroll along the waterfront lined with long rows of Yatai, and relish a hearty bowl of Fukuoka’s famous tonkotsu ramen from any of the stalls. (Time of Day: Evening; Duration: 2.5 hrs; Private Activity & Public Transfer; Meal included: A bowl of ramen and a drink; Fitness Level: Moderate; Please note that you may have to wait in line for seats as the stalls are small and popular, and do not accept reservations). Close to mainland Asia, foreign traders, merchants, and missionaries have thronged to Nagasaki since the 16th century. The only trading port during national isolation, the city has played a significant role in modernizing Japan. Discover the unique ambience of this historic town that straddles both the orient and the occident with ease. As the only Japanese town that could interact with foreign merchants during the nation’s era of seclusion, it is home to old British mansions, churches and Chinese shrines. Visit the charming Glover Hill open-air museum, showcasing the residences of European merchants built during the second half of the 19th century. Enjoy panoramic views of the city and harbor stretched out below. Stop by the Chinese shrine of Koshi-byo dedicated to Confucius, built in the 1890s. Walkover to the city’s bustling Chinatown and sample the delicious steamed dumplings at the many street stalls. Your afternoon is dedicated to the Nagasaki Peace Park that commemorates the atomic bombing of Nagasaki in August, 1945. 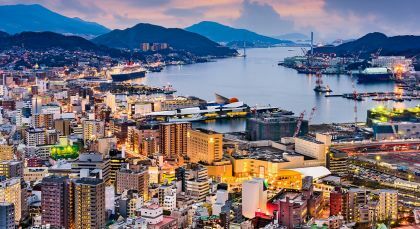 Discover how the city has recovered since that time, and visit the monuments and memorials leading up to the Nagasaki Atomic Bomb Museum and the Hypocenter Park. (Full Day; Time of Day: Morning; Duration: 8 hrs; Private Activity & Public Transfer; Fitness Level: Moderate). After breakfast, drive down from Nagasaki to the beautiful Shimabara region with your local guide. En route, you’ll pass through picturesque, verdant forests set against towering mountain peaks in the distance. From a distance, watch the famous active volcano of Mount Unzen that serves as a power source for the many hot springs in the surrounding area. Upon reaching Shimabara, visit the five-storied Shimabara Castle set right in the center of town. Explore the castle at your own pace and then amble over to a local eatery for refreshments. Indulge your sweet tooth with Shimabara’s famous ‘kanzarashi’, a delicious local dessert of rice dumplings soaked in syrup. Following your afternoon refreshments, stroll through the charming town, taking in its feudal network of canals and waterways that are generously filled with Japanese carp. Walk over to the traditional Japanese Shimeiso Garden and soak in its tranquil ambiance before heading back to Nagasaki. (Full Day; Time of Day: Morning; Duration: 8 hrs; Private Activity & Transfer; Meal included: Kanazarashi snacks; Fitness Level: Moderate). Kumamoto, nicknamed “fire country” for its proximity to the active volcano Mount Aso, invites you to explore its varied attractions. Many Japanese gardens create green oases across the city with Suizenji Joju-en, which adjoins the Suizenji Temple, being the most prominent. 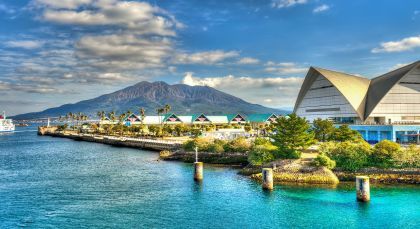 Kagoshima, with its own unique Japanese dialect, is set by the sea on the island of Kyushu. Home to hundreds of onsens or mineral springs, Kagoshima is dotted with public bathhouses that invite you to enjoy the hot springs. 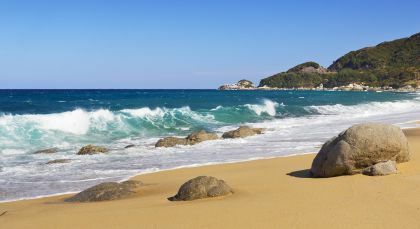 Yakushima, located off the coast of Kagoshima, is a slice of tropical heaven with its ancient cedar trees, some of which date back thousands of years. The ethereal ambiance of this natural UNESCO World heritage site has inspired plenty of animators, writers, and filmmakers who have featured it in their works.